RQ-4 Global Hawk UAV USAF, CIA Iraq, Afghanistan!!! The American Global hawk is a high-altitude unmanned airplane in use by the US Air Force. It can fly large distances to do complicated reconnaissance missions and gather information which will be send to the Joint Force Commander. The airplane is main developed by Teledyne Ryan Aeronautical in San Diego. The modernization is doing by Northrop Grumman. The airplane can also be armored with weapons. There are 2 global hawk versions:Tier II Plus and Tier III Minus. The Tier II Plus is developed for high altitude surveillance and reconnaissance mission. The Tier III the same but on low altitude. The US Air Force used this aircraft which was flown from the United Arabian Emirates to Iraq and Afghanistan. In october 2003 Germany decided to buy some of these airplanes. Called: ''Euro Hawk'' Global hawk which will be for Germany and other NATO countries. 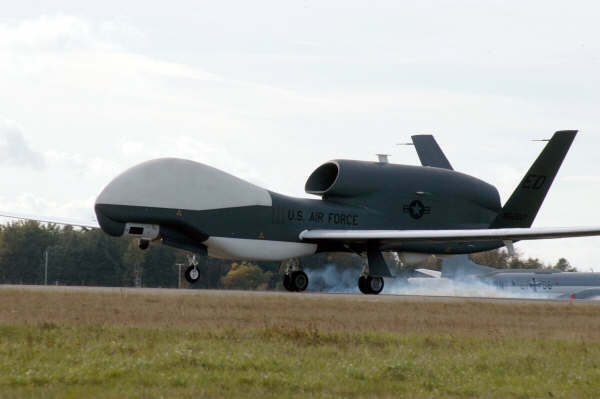 On 14 and 15 october 2003 one USAF Global Hawk was already flown from Edwards Air Force Base to Nordholz AFB in Germany. There the US Air Force, Northrop Grumman and the German Air Force did some test flights. Here for the Global hawk was equipped with German elint reconnaissance equipment. ELINT means Electronic Intelligence Sensor and is made by EADS. It can detect targets over more than 500km.